1980 Cherubini Double-Headsail Ketch The S/V Floatingpoint is a 1980 John Cherubini designed and built 44' Double-Headsail Ketch. Her sweeping sheer, low freeboard and ranked spars recalls the beauty of an era goneby. She has many options and upgraded items onboard. Floatingpoint has sailed off shore, done many blue water miles and crossed many oceans. 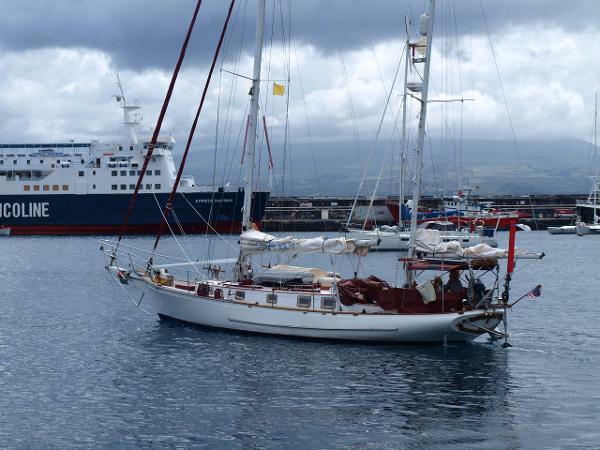 She can be sailed by two people comfortably, has a proven easy to handle ability and is at home on any sea condition. Her cockpit, salon, galley and berth areas are nicely appointed with mahogany wood throughout. She sleeps six comfortably in a forward center-line V-berth with filler, two comfortable settee berths, one pilot berth mid-ship on the starboard side and a just aft of midship quarter berth on the port side. Floatingpoint can be a family cruiser, a long distance cruiser and a superb racing vessel. She is surprisingly close winded and is able to grab the light air of summer and beat to windward in strong winds. Her Scheel Keel enables her to climb to weather like a deep-keeled vessel, while she maintains all the cruising flexibility of a shoal draft boat. While Cherubini offers many different custom floor plans every finish detail above and below deck was meticulously completed by expert craftsmen. With a draft of only 4' 10" there are no problems getting into any harbor or anchorage. She is a comfortable, gracious floating home. Floatingpoint has a custom mahogany interior salon. As you enter, the Galley is off to the Starboard side, with a center-line sink that has plenty of storage, a quarter berth is off to port side, with the navigational center just forward still to port. The two facing settees are midship with dining table center-line, a pilot berth is starboard behind the settee. Continuing forward the head is to starboard with storage drawers and cupboard. To the port side are two hanging lockers, one is in the salon passage and the other is in the master cabin. The V-berth, head, salon design are a Cherubini design, the galley/pantry, quarter berth are custom.